Our annual Black History Month celebration looked back on the Ward 8 Democrats' 35-year history with an esteemed panel of former and current Ward 8 Democratic leaders. Panelists reflected on the organization's major milestones, accomplishments, and the path forward. Next up was Ed Lazere of the DC Fiscal Policy Institute, who led a discussion on DC Budget 101. Last fiscal year, DC programmed a record-setting $14.5 billion budget that many say left more to be desired for Ward 8. Lazere talked about the DC budget process and how to advocate for the interests of the community. Highlights from Ward 8 Democrats At "Art All Night"
“Chocolate City" Co-Author George Derek Musgrove, Ph.D. participated in a special lecture series with the Ward 8 Democrats about the history of African Americans in the DC. The book traces the city's massive transformations--from a sparsely inhabited plantation society into a diverse metropolis, from a center of the slave trade to the nation's first black-majority city, from "Chocolate City" to "Latte City," Musgrove and co-author Chris Myer Asch, Ph.D., offer an engaging narrative peppered with unforgettable characters, a history of deep racial division but also one of hope, resilience, and interracial cooperation. The Musgrove lecture was co-sponsored by the Anacostia Coordinating Council (ACC) and DC Vote. You can purchase a copy of the book here. Much has been written and posted on social media about low voter turnout in June’s Democratic primary election, with pundits speculating about the causes. One popular narrative was that, counter to their well-to-do neighbors, residents of Wards 7 and 8 aren’t concerned about the future of the District or improving quality of life. This defeatist thinking is dangerous and harks back to an era when the District’s political class peered east of the Anacostia River and deemed residents’ calls for more jobs and less crime as undeserving of attention. Read full op-ed. :: Do you have ideas to help make our elections run smoother in future? If so, we want to hear from you by CLICKING HERE! The Ward 8 Democrats voted to support the reelection of Muriel Bowser for mayor of the District of Columbia. 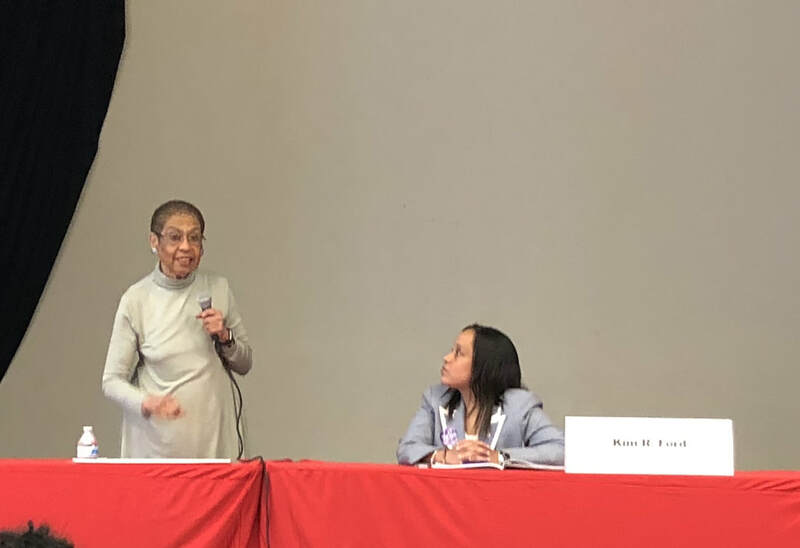 The Ward 8 political club also voted to support Congresswoman Eleanor Holmes Norton’s attempt for a 15th term, and Shadow Representative Franklin Garcia's shot at his third. The endorsement forum was held at the Old Congress Heights School in the neighborhood bearing its name, and focused on a range of topics including affordable housing, development, public safety and schools and is the final forum before the June 19 primary. The Ward 8 Democrats voted to endorse DC Attorney General Karl Racine’s efforts to keep his seat for four more years. 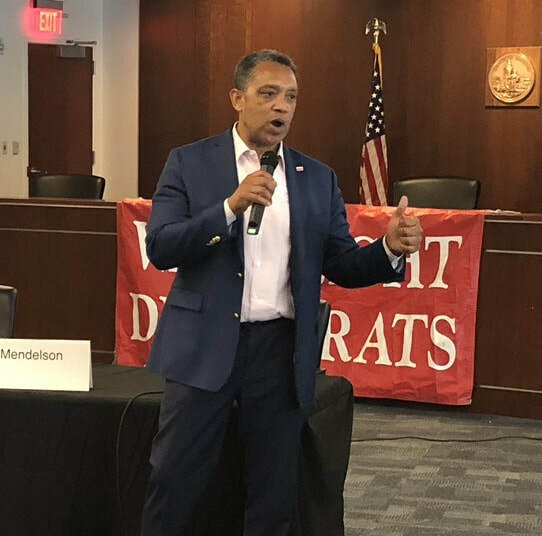 His endorsement came during the Ward 8 Democrats Candidates’ Forum for Council Chairman, At-large Councilmember and DC Attorney General. The forum focused on a range of topics including preserving affordable housing, increasing workforce development and fighting for stronger schools in Ward 8. The DC Democratic primary is Tuesday, June 19. Ward and Prestwood will join returning officers Charles Wilson, who was reelected president; Leonard Watson, Jr., who will move up one spot from second vice president to first; Tangela Garnett, appointed recording secretary in 2016, was elected to the same role; and Darryl Ross, who was reelected as treasurer. The Ward 8 Democrats extends its condolences to the family, friends and colleagues of Theresa Howe Jones, a founder of the Ward 8 Democrats, DC statehood activist, and longtime Advisory Neighborhood Commissioner from the Bellevue community. The Ward 8 Democrats joins with members of our community in mourning the loss of long-time resident and former Ward 8 Democratic city council candidate Marion Christopher Barry, the son the late mayor, councilman and civil rights leader Marion S. Barry. Endorsed Ward 8 candidate Trayon "Ward Eight" White wins decidedly in a crowded five-way council race that included current incumbent LaRuby May as well as Aaron Holmes, Maurice T. Dickens, and Bonita Goode. White becomes the first non-incumbent candidate to reach the necessary threshold for endorsement in recent election cycles.